Old-fashioned false eyelashes have met their match. 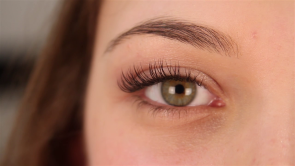 Pretty, fluttery, semi-permanent eyelash extensions have become mainstream. Beauty consumers are adding length and fullness to their lashes to create an enhanced natural or dramatic look. MYNC Lash Lounge & Brow Bar shows the lash application process. Lying down with pads placed over the lower lashes and eyes closed model Carly relaxes during the process. A technician dips one fake eyelash at a time in adhesive and then applies it to the natural lash. This is carefully repeated strategically across the fringe creating a full set of luscious lashes. Lashes last up to a month and fall out on their own just as natural lashes do. For more on lash trends and brow beauty visit MYNCBeauty.com. To find more beauty videos, press play in the LifeStyleVideos beauty category. MYNC Lash & Brow Bar also offers complete makeup services as featured in LifeStyleVideos, The Huffington Post, Elle and many more prestigious beauty publications. To find more, easy to follow beauty advice visit LifeStyleVideos Beauty or find MYNCBeauty.com directly @MYNCBeauty.